A range of steel and aluminium five a side goalposts and mini soccer goals. 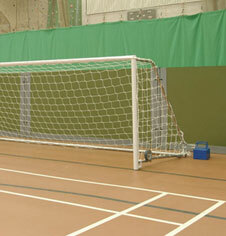 The 5 a side football goals are available as folding, wheeled or freestanding models. Available sizes are mini 2.44m x 1.22m, junior 3.66m x 1.22m and senior 4.88m x 1.22m for use on natural grass pitch or 3G synthetic play surfaces. Replacement polyethylene FPX goal nettting and counterbalance anchor weights are available for all indoor and outdoor five a side goalposts. Goals sold in pairs. Mini - Senior 50mm steel folding 5 a side goalposts. Mini - Senior 50mm steel wheeled 5 a side goalposts. Mini - Senior 50mm steel ground fixed 5 a side goals. Junior - Senior 48mm steel classic 5 a side goalposts. Mini - Senior 80mm alloy 5 a side football goalposts. Mini - Senior 102mm alloy 5 a side integral portagoals. Multiple sized alloy 5 a side fence folding goalposts.